Swing into a lifetime of enjoyment for yourself, your family and friends, plus kids of all ages. Select on of the wooden swings below from Brandenberry Amish Furniture. Amish artisans custom-build each one from solid hardwood. So they’re incredibly sturdy and long-lasting. Beautiful wood construction highlights the Adirondack Porch Swing. Stunning craftsmanship marks the Adirondack Swing Arbor. A sturdy wood frame accents the Adirondack Tripod Swing. Beautiful wood construction accents the Cedar Straightback Porch Swing. The Cedar Straightback Tripod Swing provides the perfect space for sitting and swinging in comfort. 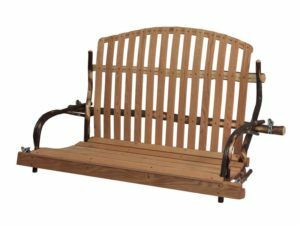 Fine hickory wood accents the Hickory Deacon’s Bench Style Swing. 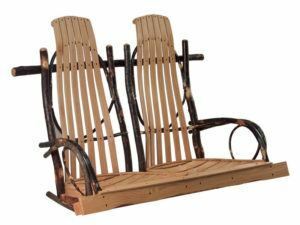 The Hickory Double Rocker Style Swing blends rustic elegance and classic construction. 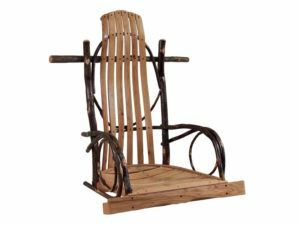 Beautiful hickory accents and wood slats highlight the Hickory Rocker Style Swing. Nothing can beat the relaxing, exhilarating experience of rocking back and forth in a swing from Brandenberry Amish Furniture. And we have quite the collection. You can select a stand-alone unit for an outdoor setting. Or you may wish to go for a swing you suspend from a tree limb or porch rafter. You can order the swing of your choice as shown. Or we can customize your favorite porch swing or outdoors swing just the way you want it.